The 2005 SF Music Award-winning ALBINO! 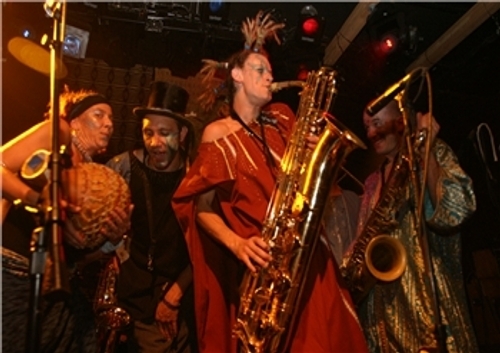 is a 12-piece all-star ensemble that honors the fiery legacy of Afrobeat visionary and Nigerian political outlaw Fela Kuti, considered ?a musical and political voice on a par with Bob Marley? (All Music Guide). Albino?s melding of tightly-crafted arrangements and jazz-tinged harmonies with propulsive, high-energy grooves have firmly established the band as the West Coast?s premier Afrobeat act. Complete with dancers, horn section, choreography, & wild costumes, their live show is an outrageous experience to behold!